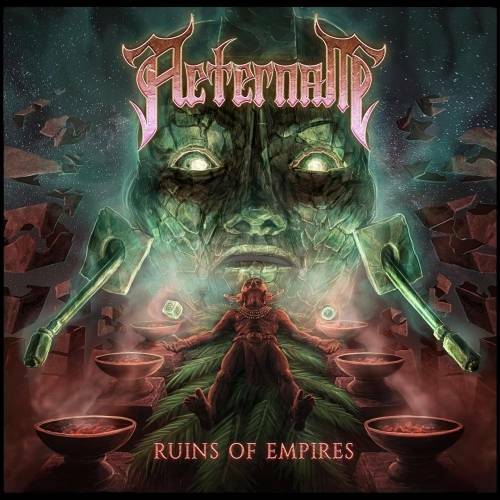 Aeternam is a melodic death/symphonic metal band from Quebec, Canada. The band is known for its Middle Eastern influences and so far they have released 2 successful releases. Ruins of Empires is their third album, it’s a great follow up to Disciples of the Unseen and Moongod that were released on 2010 and 2012 respectively. Ruins of Empires was released this year, 2017, and after a five-year hiatus since Moongod. The album is another self-produced album after Moongod. Generally, the album is what you can expect from Aeternam, great harsh vocals, beautiful Middle Eastern and catchy riffs from time to time. So nothing phenomenal or unexpected about it because that’s what you always hear from them since their first release, except that it’s more mellow than the previous releases at some parts, still as heavy and solid though. After departing with the bass player Jean-François Boudreault on 2012, they released Moongod and it was as brilliant as their debut. Now they return with another awesome release proving that the change in lines didn’t affect them negatively. The album drops its best card at the beginning of it with three solid tracks, “Damascus Gate”, “Paropamisadae” and “Sun Shield”. The three tracks tell you that Aeternam has still got what you expect from them. A great blend of symphonic, Middle Eastern and heavy death metal music all together which makes them enjoyable even if you are not into Middle Eastern music. Sun Shield is one of the heaviest tracks and one of the most consistent ones. Track number four is The Keeper of Shangri-La, the intro of this track has got South Eastern Asian influences (sounded like the erhu). Generally, it’s a soothing track with clean vocals. Track number five is ”Fallen Is the Simulacrum of Bel” and it’s at the same level as the first three tracks. The sixth track is called “Colossus”, and it contains the catchiest riffs and a combination of harsh and clean vocals together, they keep the album consistent after all. Track number seven is a pure 03:00 of mellow Middle Eastern music with symphonic influences, not to forget to mention the great and well performed clean vocals, the song is called “Nightfall on Numidia”. The last two tracks are “Praetor of Mercury” and “Zadyin Arga”. Although they are the last two tracks but they are among the top 3 tracks of the album. They are the perfect example of how mixing melodic death metal with symphonic/mellow music should be. Songs are catchy and well performed and show how much talent these guys have. If you are a fan of melodic death metal and oriental music and if you enjoy listening to bands like Orphaned Land, you definitely should give this album a try. Aeternam has its own style that can’t be found elsewhere as no one keeps this mixture of mellow and heavy music without leaning towards the mellow side. Orphaned Land has become less heavy than before (which is still awesome) but they haven’t kept following the same track like Aeternam. Although Ruins of Empires contains more mellow parts than before it’s still heavy as a whole, and who knows, maybe one they change their direction. I give this album an overall rating of 9.5/10. Highlights: “Sun Shield”, “Praetor of Mercury” and “Zadyin Arga”.